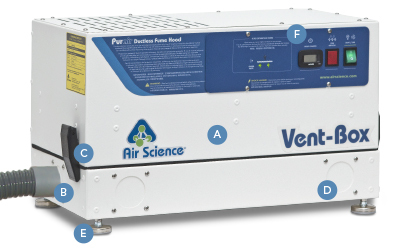 Vent-Box™ ductless filtration systems are designed to protect laboratory personnel from chemical vapors found inside of standalone chemical safety cabinets. 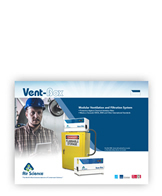 The Vent-Box serves as modular ventilation and a filtration system for all chemical safety cabinets. Compact size, easily positioned on shallow safety cabinets. 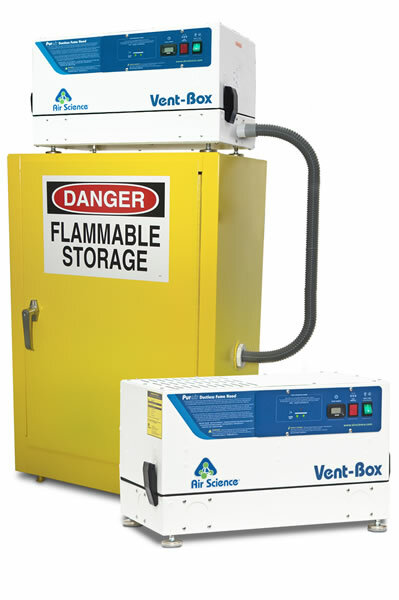 Universal connections allow retrofit to almost all available flammable and safety cabinets on the market. A. Filtration: Available with Multiplex filtration technology, a unique configuration that includes a pre-filter and main carbon filter. 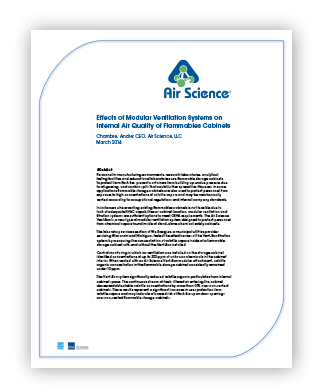 HEPA/ULPA filtration is also available. B. Hose: Each unit is provided with a PVC or metal flex hose with smooth inner surfaces to minimize pressure drop and friction loss. The vent hose is connected to the cabinet via a threaded 2" diameter (50.8 mm) metal bung adapter. The discharge end accommodates a 1.5" diameter (38.1 mm) metal or PVC hose. C. No-Tools Filter Access: The filter is easy to replace, no tools required. Simply open the easy access lid and change the filters. D. Multiple Connection Configurations: The Vent-Box comes equipped with four possible intake connections, allowing you to easily configure the unit to meet your space requirements. E. Exhaust Port: Slotted exhaust port allows for an optional bolt-on ducting collar that allows connection to existing in-house ductwork. F. Leveling Feet: Equipped with adjustable leveling feet that ensure solid placement on a variety of surfaces. G. Control Panel: Electronic controls and displays include switches for the blower and a low airflow alarm.